IN 1981 I bought a new brick built three-bedroom house complete with garage, central heating and mains drainage on the outskirts of London. It cost £31,000 (€36,600). In 2002 I bought a brand new concrete villa in a small village in Cyprus. No garage, no central heating, no mains drainage with a 1980 value of €36,000, that is according to the Paphos Land Registry. So both homes are worth roughly the same. Really? A house on the outskirts of London worth as much as a village house in Cyprus? I have tried to find out how the 1980 value was calculated but failed. I’ve been informed that is a secret formula used by the Land Registry which I wouldn’t understand. I can appeal the valuation by spending several hundred Euros on getting my own surveyor, but I’ve also been told that this will be a waste of time and money, so it’s cheaper to pay the IPT. Today the house in the UK (according to Zoopla) is approaching £340,000 Sterling or €400,000. A resale Agent told me that if I wanted to sell my Cyprus villa it was worth about €230,000, but if I was offered €220,000 I should accept it. I wonder how much the Land Registry will value my villa for 2014? Across the road are two similar properties built by Greek Cypriots on family land, I have no way of finding out what their 1980 value is. There is no transparency in the system, and where there is secrecy there is always corruption. Close by is a small farm house, which is below the €12,500 threshold. It has been a family home for several generations. So whilst I pay my IPT having worked all my life to clear off a mortgage this house will contribute nothing, and has never had the onerous task of a mortgage. The land and property owned by the occupier way exceeds my income. What is fair about that? Why can some people be excused their share of support for our Government? Why should it be based on the value of a house? I used all my savings and borrowed from our daughter to buy our title deeds, paying an inflated cost to the Land Registry well above the cost of the contract, and borrowing more to pay my developer’s tax bills. My daughter lent us the money knowing we will never be able to repay it. Cyprus has it appears has always relied on foreigners to pay for the lifestyle of the many. With 70 per cent of the properties now excluded, having a 1980 value of €12,500 or less, the burden of reaching the troika threshold will fall on the remaining 30 per cent, mostly on the newly arrived expats. This amounts to both direct and indirect discrimination against foreigners and is contrary to EU Law. Our president says he wants a clean governance with responsibilities. Well as Huckleberry Finn said. “Just you saying it’s so, don’t make it so”. a) Properties sold, used as collateral: After 2011 this is no more possible, under the new Specific Performance Law. But even under the old Law only Mortgages concluded BEFORE a Contract of sale affected the purchaser. The existence of such Mortgages could be confirmed by a search carried out by the prospective purchaser or his lawyer. b) Liability of the banks: I agree, this is one of the reasons for the present financial crisis. c) Delay in issuing titles: This is true. Much progress has, however, been made. Today thousands of titles exist which have not been transferred in the name of purchasers for various reasons. d) No records for properties: I don’t understand what you mean. e) Absurd secrecy: A prospective purchaser has the right to know everything about the property he intends to buy, by obtaining a formal search certificate from the Land Registry. This applies also to actual purchasers at any time. In conclusion things improve when we know and claim our rights. How can the system be ‘generally sound’ when developers are able to use properties they have already sold as collateral on loans, when banks do no due diligence on the ability of developers to repay any loans, when title deeds are denied to buyers for many years, when there is no record of thousands of properties, although they are connected to both the water and electricity system, when the who process is surrounded in absurd secrecy? ? Unfortunately the land registry system in Cyprus is not fit for purpose and must be brought in to the 21st century if there is any hope of the property market ever recovering. Transparency: I would agree with you that the Personal Data Protection Act is applied rather strictly in Cyprus. For example only valuers and lawyers may obtain information about comparable sales. Things are changing however (now for example potential purchasers can obtain information about the property they intend to buy, thus eliminating the risk of buying mortgaged or otherwise problematic property). Consumer price index: This index, Steve, is relevant only for Capital Gains Tax and has nothing to do with Immovable Property Tax. General comment: Certainly the property system in Cyprus (including IPT) is not an ideal one. Some complaints are, however, based on misconception and/ or personal traumatic experiences. The system is in general sound and there are a lot of decent professionals and officials dealing with property matters. Unfortunately there are some rotten apples in the basket who spoil the whole system. @Steve – Unfortunately, property prices do not follow inflation, but it would make life so much simpler if they did. Increases in property values since 1980 vary depending on what those property are and where they are situated. (The chart below gives an indication of increases between 1980 and 2010). @Andreas D. Symeou – the fact that the Inland Revenue has already collected â‚¬85 million in Immovable Property Tax clearly demonstrates that Cypriots are indeed paying. The problem is that the general lack of transparency and secrecy results in suspicion. I have a holiday home in the UK and I can easily find out how much I paid and how much my neighbours paid for their properties and their Council Tax banding. And if I was considering buying another property in the UK, I can find out the prices of comparable properties in the same area – and how much the current owners paid for the property and when they purchased it. Implement electronic access to the registries of title deeds, mortgages, sales contracts and cadastre for the financial sector and government services by Q4-2014. Personal data privacy legislation shall be reviewed and amended to alleviate legal impediments to such electronic access, in particular concerning the procedures for proof of legal interest by Q2-2013. Hopefully these changes will help to increase transparency and reduce suspicion. I find Mr Davis’s article to be somewhat misleading. The values of UK and Cyrus properties have moved up, and down, at different rates at different times so he is not comparing apples with apples. The 1980 basis for valuations here is not well understood, which renders it liable for a lot of criticism. I asked the developer to explain the calculation for my property. http://www.cystat.gov.cy gets you the Cyprus government statistics. Click on English then go to Economy and Finance/consumer price index and download the data file for CONSUMER PRICE INDEX – BASE 1992, 1980-2013. Take the 1980 figure, divide it by the figure for the month in which the handover took place and that is the factor to multiply the house price by. For example, Jan 1980 = 52.72. October 2008 = 167.63. 52.72/167.63 = 0.3145. Multiply by the purchase price and that’s the 1980 value for a handover in october 2008. Of couse it wouldn’t be Cyprus without some fiddling, so the buyers have sometimes colluded with sellers to save money by declaring a low purchase price in contracts of sale and the Land Registry could make arbitrary judgements about the real price. That’s where the secrecy comes in, that’s the part that the Land Registry won’t explain because it can’t be explained. There is no transparency in Cyprus. Sadly the constant deceit has been continuing for decades. The telephone number prices being banded about are nothing more than figments of sellers imaginations and surprisingly they found that there were those who actually paid them, as a result the inflation started. Those familiar with the Island in the 50’s, 60’s and 70’s will be aware of the true worth of property given inflation and improved infrastructure whether it be urban or rural and it is nothing like what is being banded about in this day and age. However as long as there are those who, for reasons best known only to themselves, are prepared to pay what is being asked then the prices will continue to be asked – obviously. A reality check is long overdue. 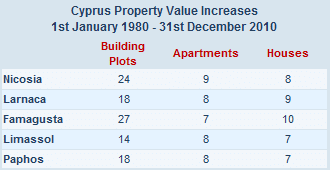 As for 1980 values I can tell you that 80 donums of land in the North Famagusta region was valued at CYÂ£300 and 6 donums just North of Limassol CYÂ£350. The latter on 1/1/80 the former prior to that. Mr Davies makes a valid and topical point and I agree with him however I am not sure how one can legislate against discrimination (other than lip service) as it is evident in one form or another throughout Europe and the world in general. I suspect the formula to calculate values is simply whatever they think people will pay fully backed up by a wet finger held to the wind. a) The percentage of owners not paying IPT is very low, certainly much lower than 70%, as the whole property of each owner is taxed and not each property separately. So e.g. if the owner of the little farm house mentioned by Mr Davis has other property, he will, most probably, pay IPT. b) There is no discrimination against foreigners. Actually, as most of the local people own other property in addition to their house, they DO pay IPT. c) There is no secret formula for valuing the properties. Valuation is based simply on comparable sales. In the case of mr Davis, it is implied that a similar villa in Drousha would sell for 36,000 euros in 1980.
d) The Government has admitted that the IPT system is not fair. It will become fairer when all properties are valued in 2014 values. In that case, if Mr Davis’ villa is valued more than 220,000 euros, he has the right to lodge an objection. Sounds very true. My 80 sq.m flat in a very average building in Limassol is valued about the same as your villa. And indeed most of processes in local government structures are extremely non-transparent.